OSLO (Reuters) – A North Atlantic current flowing into the Arctic Ocean is warmer than for at least 2,000 years in a sign that global warming is likely to bring ice-free seas around the North Pole in summers, a study showed. 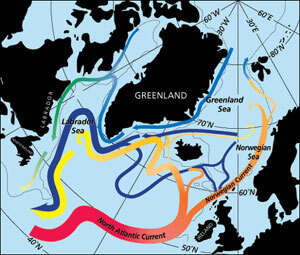 The North Atlantic Loop Current moderates winters in Europe and influences ocean temperatures in the Arctic. Scientists said that waters at the northern end of the Gulf Stream, between Greenland and the Norwegian archipelago of Svalbard, averaged 6 degrees Celsius (42.80F) in recent summers, warmer than at natural peaks during Roman or Medieval times. “The temperature is unprecedented in the past 2,000 years,” lead author Robert Spielhagen of the Academy of Sciences, Humanities and Literature in Mainz, Germany, told Reuters of the study in Friday’s edition of the journal Science. The summer water temperatures, reconstructed from the makeup of tiny organisms buried in sediments in the Fram strait, have risen from an average 5.2 degrees Celsius (41.36F) from 1890-2007 and about 3.4C (38.12F) in the previous 1,900 years. The findings were a new sign that human activities were stoking modern warming since temperatures are above past warm periods linked to swings in the sun’s output that enabled, for instance, the Vikings to farm in Greenland in Medieval times. “We found that modern Fram Strait water temperatures are well outside the natural bounds,” Thomas Marchitto, of the University of Colorado at Boulder, one of the authors, said in a statement. The Fram strait is the main carrier of ocean heat to the Arctic. Ice on the Arctic Ocean shrank to its lowest on record in 2007 and many experts expect the ocean will be ice-free in summers in coming decades, a threat to the hunting livelihoods of indigenous peoples and to creatures such as polar bears. The Arctic is heating up twice as fast as the global average as part of a trend the U.N. panel of climate scientists blames on a build-up of greenhouse gases from mankind’s use of fossil fuels in power plants, factories and cars. The shrinking of reflective ice and snow in the Arctic region exposes water or ground which are darker colored and so soak up more heat from the sun, amplifying warming.